Today, I began volunteering at Green Youth Farm. And let me just say an obvious axiom about poetry: It doesn’t happen just on the page or in the classroom or when reading a book curled up on the couch or in an airplane seat. It happens in the garden. Poetry is a kind of magic. 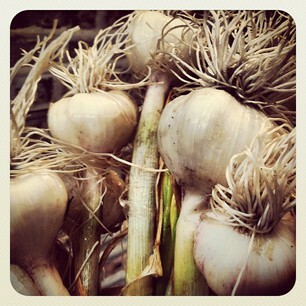 And so is garlic. You dig a hole for a clove of garlic, you cover it with dirt, with hay, you wait and wait, it grows and grows a mathematical white dress in the unseen places below the dirt near the earwigs and the worms, the green shoots and scapes escape through hay signaling life, life, life. Then you assign a group of teenagers, and an odd poet to pull up the garlic, to tie it in bundles and hang it to dry from the hoop house. There are a fifty or so poems right now in a hoop house in Washington Park on Chicago’s South Side marinating in the summer heat, drying into the kind of poetry you can eat. ← Dinner with Poets, a list.